Raw tarts seem to be all the rage these days. Though I have a hard time dropping over ten dollars on nuts and dates, the fact that I can whip up a killer dessert in very little time, without having to turn my oven on, is genius. During these muggy summer days, the last thing I want to do is pump more heat into the house, and my sweet tooth seems to crave anything cold and raw (vanilla ice cream and fresh cherries? yes please!). There are a variety of different recipes on the web (caramel apple, berry, fruit pizzas, peach and ginger coconut), but I gravitated towards nectarines after tasting some from the market the other day that I had bought for a green rice and corn salad. 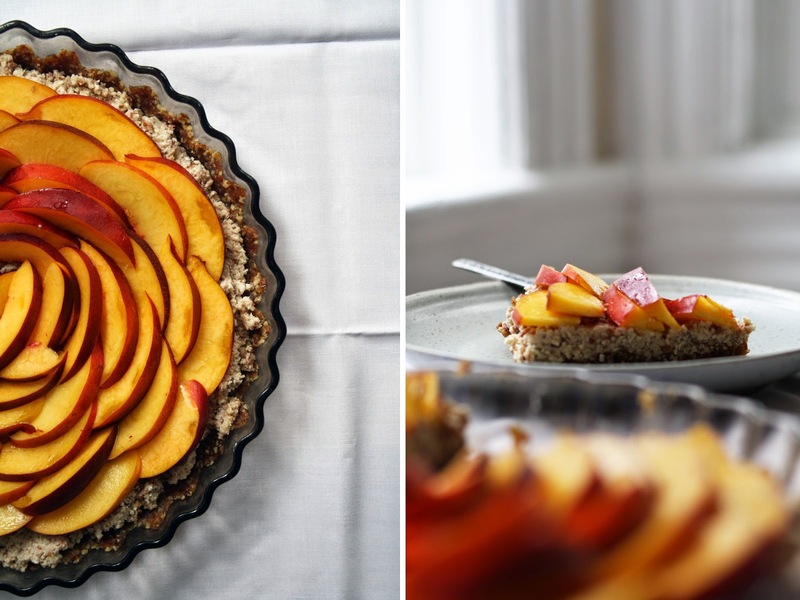 The nectarines were perfectly ripe, juicy, sweet and totally destined for this beautiful summer tart. Soak the almonds and cashews in a small bowl covered in water for 6 hours, or overnight. In a food processor fitted with the s-blade, pulse the walnuts and 9 dates until chopped and combined (~45 seconds). Pinch the dough -- if it holds together you're golden, otherwise, add another date or two and pulse again. Place the dough in a tart pan, pressing down firmly and spreading evenly. Cover with plastic wrap and transfer to the freezer until ready to use. Drain the almonds and cashews and transfer into the body of a food processor or high speed blender (a blender would probably be best, but I don't have one and my food processor worked just fine). Add the remaining dates, milk, vanilla and cardamom. Blend/pulse until combined and 'smooth'. Transfer to a tupperware and store in the fridge until game time. When ready to serve, or just before your guests arrive, scoop the cream onto the crust and spread evenly. Begin to lay your nectarine slices in a circle from the outer perimeter working your way to the centre. Store in the fridge until ready to serve -- for breakfast or dessert. Will keep in the fridge for about a week.